The all-new midsize 2018 Honda Clarity Plug-in Hybrid Coming Soon to Seattle will not only be affordable, but will offer quality content and features. The 2018 Honda Clarity Plug-in Hybrid has an estimated 42-mile all-electric range, and lets you go further with 330 miles when you factor in the 1.5L four-cylinder gasoline engine. To top it off, it produces zero emissions. Visit Klein Honda of Everett for further details on the Honda Clarity Plug-in Hybrid, scheduled to be released in 2017. The Honda Clarity Plug-In Hybrid offers ample seating for five, and significantly more passenger and cargo volume than competition. Once inside the cabin, you will notice that the premium interior has been designed with environmentally conscious materials, and made in an earth-friendly manner. Also included is the Honda satellite-linked navigation system that features lane guidance, 3D graphics and many more features to assist in your destination. Connect your compatible devices and have access to your music playlist, text messages and many more with Apple CarPlay and Android Auto. Available on the 2018 Honda Clarity Plug-in Hybrid Coming Soon to Seattle is Honda Sensing, which is a full suite of safety and driver-assistive technologies that have been designed to alert the driver of things that may possibly be missed while behind the wheel. When describing the 2018 Honda Clarity Plug-in Hybrid, you can’t help but notice the design is unique, and boasts many appealing aspects. Like the full LED headlights that provide a distinct signature, excellent visibility, and stands out from other hybrid models. 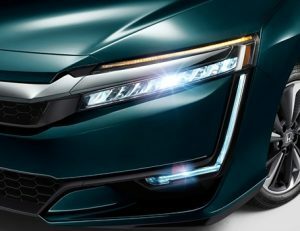 The Honda Clarity has a noticeable appearance and wide stance thanks to its full LED taillights, and has been specially designed with tires that provide optimal performance and efficiency, and are equipped with 18-inch alloy wheels that feature an aerodynamic design for brake cooling and performance. For more information on the 2018 Honda Clarity Plug-in Hybrid Coming Soon to Seattle, visit Klein Honda of Everett located at 10611 Evergreen Way in Everett, WA. Klein Honda is the go-to dealer in regards to new and used Honda vehicles, and our sales team ready to answer any questions you may have about upcoming Honda vehicles. You may reach us by calling 888-657-2544 or our online chat feature. We proudly serve the Everett community and surrounding areas like Lynnwood, Marysville, Bothell, and Redmond.